Image taken at Si Ma Tai 司马台 section of the Great Wall, near Beijing, China. Simatai (simplified Chinese: 司马台; traditional Chinese: 司馬臺; pinyin: Sīmǎtái), a section of the Great Wall of China located in the north of Miyun County, 120 km northeast of Beijing, holds the access to Gubeikou, a strategic pass in the eastern part of the Great Wall. It was closed in June 2010. Some reports have suggested October 1, 2012 as the reopening date. Originally built during the Northern Qi dynasty (550–577) and rebuilt in the Hongwu years of the Ming dynasty. Simatai Great Wall is 5.4 km long with 35 beacon towers. This section of the Great Wall incorporated the different characteristics of each section of the Great Wall. A specialist on the Great Wall, Professor Luo Zhewen, has said “The Great Wall is the best of the Chinese buildings, and Simatai is the best of the Great Wall.” UNESCO has designated Simatai Great Wall as one of the World Cultural Heritage sites. Simatai Great Wall is separated by a valley into eastern and western parts. The western part appears gentle with 20 well-preserved watchtowers dotting along the wall. The eastern part is much steeper, following more rugged terrain that includes cliff edges and kilometre-high peaks. A tower along the Simatai stretch of the Great Wall Tower 12- the last accessible tower, generally manned by a guard preventing access to the more dangerous sections further on. Heavenly Ladder: Climbing the mountainside at a steep 80-degree gradient, the Heavenly Ladder leads to the Fairy Maiden Tower. Stretching upward along the abrupt mountain ridges, the narrowest part is just half a meter wide. Tower 15 – Fairy Tower (Xian Nu Lou): With a sculpture of twin lotus flowers above the arched doors, it is considered by many to be the most beautiful of all towers and is known for its architecture. Legend has it that it was the dwelling place for an antelope reincarnated in the form of an angel who fell in love with a shepherd. 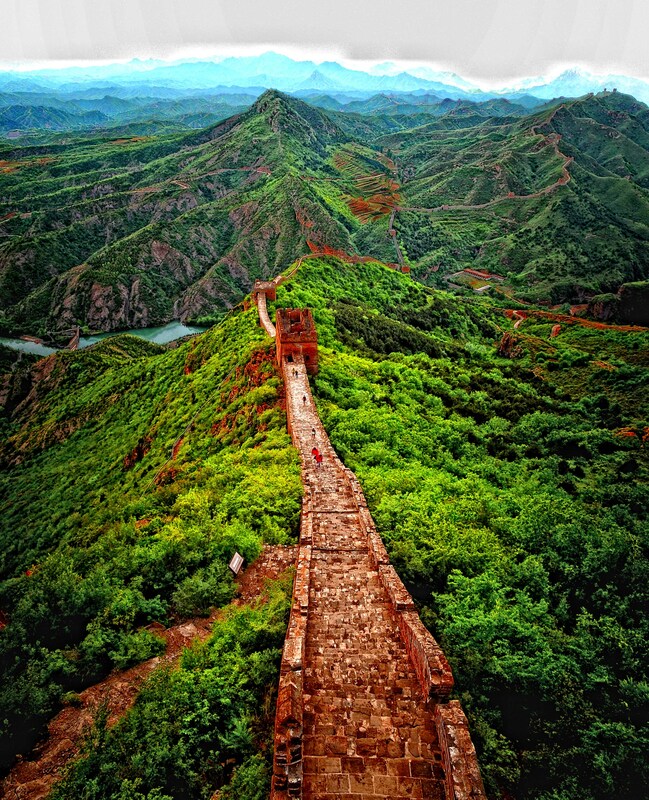 Sky Bridge: As little as 40 centimeters wide in places, this 100-meter-long segment of the wall connects the Fairy Tower to Watching Beijing Tower. Tower 16 – Watching Beijing Tower (Wang Jing Lou): At an elevation of 986 meters, it is regarded as the summit of the Simatai Great Wall as well as the highest cultural relic in Beijing. Its name comes from the fact that at night (with good visibility), one can see the lights of Beijing shimmering in the distance 120 km away. The bricks used to build the walls here even stamped with the date on which they were made and the code numbers of the armies that made them. Tower 17 – Ju Xian Lou – accessible from the East, from the village of Tangjiazhai. Wow! I am speechless at the beauty of this photograph! Must visit China! This is a magnificent image! Thank you for sharing the history behind it. This was a wonderful read! What a great series of photos and very interesting text…….. you are always opening doors to new experiences. This colour image amongst the monos has total impact…….. most excellent Mark. Amazing as always. I love your eye and your view.